The holiday season is the perfect time to show your customers that you’re thankful for their business. 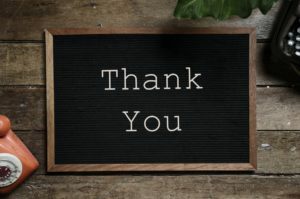 Here are five simple ways to show your customers that you’re thankful. In today’s modern world, email rules supreme, but an old-fashioned greeting card is still king when it comes to customer service. Whether you hand-write a greeting inside or use a personalized stamp, your customers will appreciate the personalized touch. Plus, it’s a great way to put them in the holiday spirit and encourage them to spend money with your business. In today’s world, social media may be the norm, but you can still get social in real life, too. Why not host a social gathering or event for your best customers? Invite them to your business for light refreshments and a chance to meet your staff. Or hold a special ‘preferred customer’ shopping event after-hours. These simple events can make any customer feel like a VIP. Nothing beats a random gift for making your company stand out in your customers’ minds. Let your customers know you appreciate them by sending them a small token of your appreciation. This can be a great way to clear out old promotional items or a fun way to introduce new ones, and everyone loves a freebie! Are you about to introduce a fun new product or service? Why not hold a contest asking your customers to choose the name of the product? Getting your customers involved with your business can make them feel like a part of your team, and it can help boost customer loyalty, too. Whether you hold free classes on how to use your products, or you create elaborate how-to videos for your customers to view, taking the time to teach them something new will show you care. You can personalize whatever you teach to fit with the products and services you offer. Maybe you can send out free recipes if your products are related to food and drinks. Perhaps you can teach computer skills for your tech customers. Whatever you teach, sharing skills shows you care. Answer 365 can help you with your customer service and call centre needs. Call or visit today for more information.